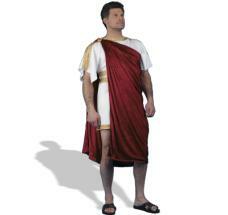 From Barackopolis: How To Dress in “The Temple of Obama” | the "silent" majority no more! This is the actual release from the McCain campaign. The Dress. 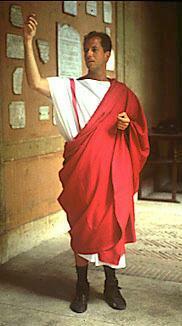 Read more on How to Wrap-That-Toga! 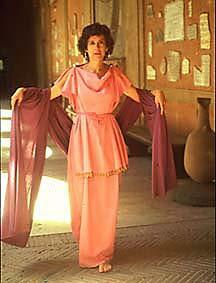 Why the faux Greek Temple at Obama’s mass rally at the Invesco Park, you ask? Actually, it’s probably not his God Complex. It’s just the basic stagecraft of visual illusion. If you want an actor on stage to look tall, put him in a short frame. It’s sometimes called “forced perspective“. The most famous example is the Ames Distorted Room, and the wonderful website VisualFunHouse.Com has an example called the Little People Optical Illusion. Except that the Obama’s stage director will make him look big, tall, and closer than life instead of small, short, and distant. A Greek Temple is a perfect way to frame a human figure, and change perspective any way you like. (snip) …Now take a look at the Barackopolis. (snip) These are very powerful illusions… The people behind the Obama are very crafty. The Democrats are rich in Hollywood talent. Bill Clinton had the Hollywood power couple Harry and Linda Bloodworth-Thomason, who performed similar tricks for him. The media photofrauds knew all about it, of course, and celebrated how well the Clintons’ slick trickery fooled the American public. That’s how Bill the Draft Dodger was able to look like he was marching a platoon of US Marines up the West Lawn of the White House, and still look taller than all those tough guys behind him. That’s how he was able to win in 1996 against Bob Dole, who still bears lifelong injuries from the Italian campaign in WWII. Dole didn’t like to talk about that during the campaign; but that hurt him in the election. So you’re going to see pure visual illusion. What does that tell you about Obama and his inner circle? This is turning into a Greek farce, not a drama. Let’s hope it doesn’t turn into a tragedy by November. Pingback: Great DNC Photo Journalism from “Looking at the Left” « the “silent” majority no more!